When it comes to free or paid screen capture software, there are a plethora of them which are currently available for the PC users. These software are quite useful, especially in the case if you wish to record your gaming sessions or merely capture the screen for creating great tutorial videos. Wondershare’s Filmora Scrn is among one of these tools which aim to make this entire recording as well as editing process as simple as it can be as the company behind is popular for some of the best software such as Video Converter Ultimate, PDFelement etc. Filmora has been able to integrate a minimalistic video editor which is fitted right into the screen recording software. We have examined a lot of video recording software for the purpose of screen capture, and most of them lack in the editing department. In case you are searching for a simple and elegant solution in order to capture your screen then you should probably look into this software as we dig deeper into the features and characteristics of Filmora Scrn screen capture software. The first thing about this software is that it can record up to 120 fps. While most of the video recording software tends to cap out at 60 frames per second, this software goes to whole different level to let its users to record the videos at 120 fps. It is quite useful in case you are using a monitor having a refresh rate higher than 60 Hz. This great feature of 120 Hz recording makes a huge difference especially when you are recording your gameplay of fast-paced games like Counter Strike: Global Offensive, Overwatch etc. It is quite helpful in case you wish to have the final footage to be made into slow-motion, after doing some post-production work. Apart from this high frame rate recording, the users are also able to record at as low as 15 fps. Another major feature of this software is that it allows you to record the screen as well as webcam simultaneously. It not only captures your screen but also allows you to capture your face in case you have a webcam. You will be able to adjust both the recording resolution as well as the frame rate of the webcam, which depends on the hardware that you have. It is quite useful for Facecam especially in case you are planning to record and upload any tutorial videos or your gameplay footage to YouTube. The screen recording, as well as webcam recording, will be duly displayed quite neatly in a picture-in-picture format. One of the salient feature of this software is the audio capture that it provides. Along with screen and face recording, it allows you to record audio in case you have a microphone, irrespective of whether it is in-built or dedicated one. You can easily enable or disable it as per your preferences, but it is quite a useful feature in case you are doing any live commentary while explaining things on your tutorial videos or gaming using a high-quality microphone. Another useful feature that caught our attention is its built-in video editor. It is quite a standout feature of the software which most of the similar software miss out when it comes to video editing capabilities. It is quite necessary in case you wish to enhance the final footage of yours before you upload it to social networking websites by adding some cuts, music, annotations and much more. Immediately after you open up this application, you are taken to a menu where you can choose between screen recording and video editing. After you have completed your recording session, this software asks you automatically whether you are interested in exporting the particular footage to the editor.Along with editing recorded videos, you can also browse as well as import any of the other videos that are on your computer. It is quite easy to use and doesn’t require any previous knowledge on video editing whatsoever. However, the tools which are available for the users are very much limited, and it can’t be taken as a dedicated and complete video editor for advanced users. One of the remarkable features of this software is its minimalistic user-interface. In entirety, this software is cleanly designed, and the controls are not at all cluttered, and this makes it quite simple for the beginners to use. All it requires is simply opening the software and hitting the F10 button in order to start the recording process right away. It can’t get any easier than this. When it comes to video editing, this software performs a splendid job since it makes easier to use for even the most novice and inexperienced users. Annotations, music and cuts can easily be performed within few minutes, all depending on the video size. 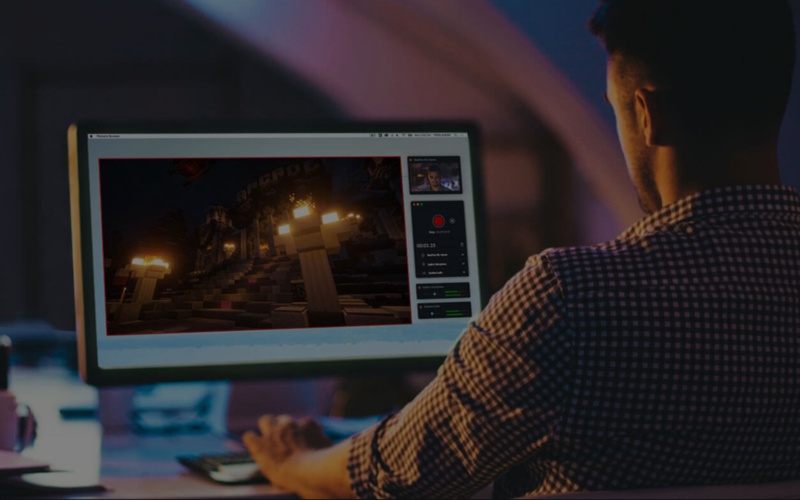 However, it does lack advanced video editing tools which make the professional users look for alternative, a dedicated video editing software in order to meet their demands of post-production. Filmora Scrn can easily be downloaded for both Mac and Windows devices from its official website for free of cost. As long as you have the unregistered version of the software, you will only have access to a limited set of features. In case you wish to take complete advantage of this software then you have to spend either $19.99 on a yearly basis, or you can opt for $29.00 for lifetime access to this software along with its unique and powerful set of features. Both of these available options come with all of the software updates free of cost. It is perfectly suited for beginners. It does affect the performance in games which is quite noticeable. It also lacks advanced tools in its Video Editor. It is not suited for professional and advanced users. Filmora Scrn is considered to be a game recording software by its company itself, it remains to be one of the best software available in the market especially in terms of simplicity as well as capabilities. It is capable of recording at astonishingly fast 120 fps. It also manages to record all of your gaming sessions with ease, and you can also add audio to it. It also comes with screen recording as well as webcam recording in a picture-in-picture fashion. However, this software does fall short when it comes to certain aspects such as its impact on the performance of the gaming as you will certainly experience frame drops which are noticeable, while you are gaming as well as recording, simultaneously. Having said that, it does have a built-in editor which is quite useful for the beginners even though it does lack few of the advanced features. However, it does allow the users to cut, add annotations, as well as add music with quite an ease. In case you are looking for good software for screen capture at a decent price then this software is certainly worth a look. Try this software and don’t forget to let us know about your experience. Also, mention your views on our review in the comment section below.